Potent, stealthy and distinctive. The Reaper from Dievas is a king among "stealth" watches. 42mm with a bi-directional 24hr GMT bezel, this tribute to the General Atomics MQ-9 Reaper drone (and sharing its namesake); Dievas Watch Company’s The Reaper bears killer looks that betray its functional yet beautifully simple inner workings. Driven by ETA2892-2 movement and undergoing strict quality controls similar to high end Swiss watchmakers, this is one men’s luxury watch that is not only affordable but reflects a high level refinement that one usually finds with luxury watch ateliers like TAG Heuer and Omega. The steel imperfections are first eradicated and then The Reaper goes through a trade protected Dievas 6SteelBlack treatment that not only hardens the case to be super resistant to knocks and scruffs but also adding that special dark stealth effect that makes this a great watch for ninjas and super spys. Back: Screwed see-through sapphire glass. ETA2892 movement finished with Rhodium plated with Incabloc anti-shock and decorated Dievas rotor. Potent, stealthy and distinctive. 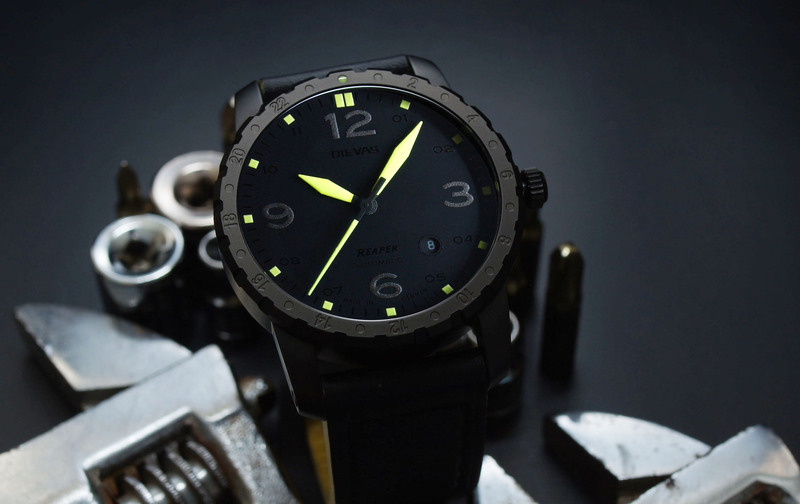 The Reaper from Dievas is a king among “stealth” watches. How is this affordable? There’s only 50 being made! Yes. Indeed it’s a limited edition run, however that doesn’t detract from the price tag of less than US$1500. For a watch that is built to specifications on par with German watch brand Sinn, you are getting a real bargain with the Reaper. That said, if you have missed out on the Reaper, there’s no reason why you can’t see what else from Dievas strikes your fancy. They are all affordable for such high quality, well machined timepieces.